From the kitchen of One Perfect Bite...If her recipes don't inspire you, I suspect her words and command of language will. M. F. K. Fisher was, arguably, the finest food writer of the last century. Strangely enough, she never considered herself to be that. Her keen eye surveyed the human condition and her strong voice used food as a metaphor to describe what she witnessed. She recorded what she saw, and wrote with such authority and compassion that her essays, articles and short stories captivated the audiences who read them. Born to a family of journalists, she understood the power of the written word. Her education and travels exposed her to other cultures and the food that sustained them. She combined her knowledge of food and language and, in doing so, set the standard by which food writers are still judged. She is most deserving of the place she has been given in Gourmet's list of the 50 most important women in food. Her five books on food, now combined and reprinted as a collection, The Art of Eating , reveal her to be a perceptive writer for whom food preparation was just a small part of a much larger story. In her own words: "It seems to me that our three basic needs, for food and security and love, are so mixed and mingled and entwined that we cannot straightly think of one without the other . . . There is a communion of more than our bodies when bread is broken and wine drunk." Many consider her to be the inventor of food writing. It's hard to argue with that. I thought you might enjoy hearing a few of her reflections. When I saw this video, I knew that the recipe I selected to represent her work would have to be one for bread. I went back to one of her earliest books How to Cook a Wolf, which dealt quite humorously with wartime rationing, and found this recipe for Bucket Bread. The bread is good, the book is much, much better. 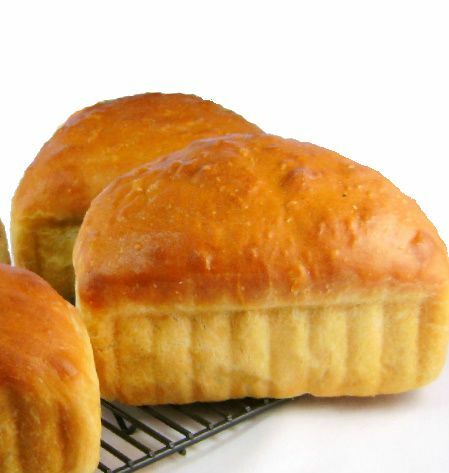 Here's her recipe for Addie's Quick Bucket Bread. Dissolve the yeast in the water. Melt the shortening in the milk, but do not let it boil. Combine the two liquid mixtures in a big bowl. Into another big bowl or kettle sift the blended salt, sugar and flour. Pour the liquid gradually into the flour, mixing well, and when feasible knead until smooth. Put the dough into a heavily greased pan, cover with a clean napkin or towel, and let stand in a warm place until double in size. Knead lightly, and let rise once more (about 3 1/2 hours altogether). 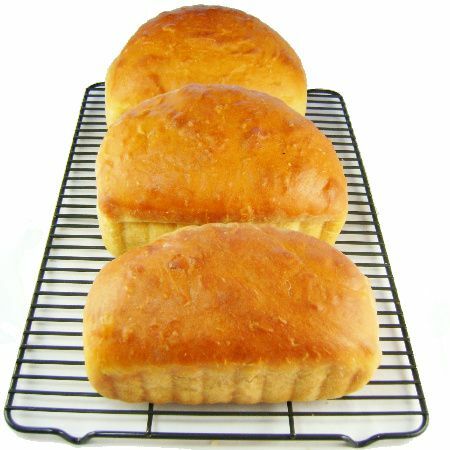 Make into loaves (Addie slashes her dough into pieces with a sharp knife and then slaps it into shape as if it were a Bad Boy…but any good recipe gives as logical, if less lusty, a procedure), put into well-greased pans, and bake at 350 degrees for about 1 hour. Brush butter on the tops when once they start to brown, and again when the loaves are removed from their pans. Additional recipes and tributes to M. F. K. Fisher can be found on these wonderful blogs. Everyone is welcome to participate. If you'd like to join us next Friday when we salute Marcella Hazan let me know via email.